National Agents Alliance is the one of the largest association of agents and agencies in the United States, spanning more than 48 states and representing millions in annual financial services sales. This growth has been sustained through high-customer satisfaction, innovative lead programs, word-of-mouth referrals and quality of service. We do it the old-fashioned way: we serve our clients. 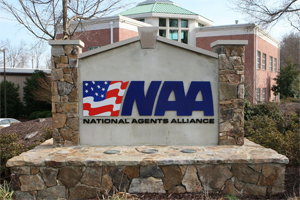 The origins of National Agents Alliance and its relationships go back more than 20 years, but took on national prominence as a company in 2002. National Agents Alliance is postured to be the largest and most aggressive distribution system for financial products and services nationwide over the next five years. The foundation for this growth will always be by putting the client's need first and foremost. We hold our agents accountable to the highest standards of ethics and do not tolerate anything less than their best. NAA Life is your source for mortgage protection and offers multiple options to meet each family's needs and budget. Because National Agents Alliance is dedicated to giving clients maximum protection, there is an abundance of carriers for agents to find the most competitive rate for the family. Mortgage protection covers your mortgage in the event of death. This protection will pay for the house and relieve a heavy financial burden on the family. There are several types and each agent at National Agents Alliance is trained to find the best plan for you. Our mission is to provide the best financial products with the kind of in-home, professional service that is second to none. Our operating credo is: "Your clients don't care how much you know until they know how much you care." We take a personal interest in each and every one of our clients. We believe that knowing our clients' wants and needs is the foundation to recommending the best financial strategies that will provide exactly what each client wants. We are a broker agency that provides you with the best opportunity to find the financial product that will service your needs as well as your budget. We have the ability to provide a diverse number of insurance companies and financial products so you are not limited a single company's products. This is a limitation with most "captive" agents. They can only sell you a limited set of products which they try to shoe-horn into your financial portfolio, whether it is the best product for you or not. We are constantly researching the latest, cutting-edge, cost-effective products from only highly regarded companies that are of the "A" class rating or above from A.M. Best - the No. 1 financial rating company in the world. This means that you don't have to shop because we have done the shopping for you. We are your personal agents so you can call us anytime you have a question or need information. Yes, you can call directly the individual financial services company whose product you purchased, but rather than be put through the menu system gauntlet, you can call our agent directly and they can run any issue down for you with just one phone call.